Why does steel corrode? Unless steel is protected it begins to corrode as soon as it is made from its raw materials and it is exposed to oxygen. This is called oxidation. If you want steel to have a long life, it needs to be protected from oxygen. The simplest way to stop steel from corroding is to completely coat it with paint or a protective film that keeps air and rain off all surfaces and out of the nooks and crannies of the vehicle. The way auto-makers protect their steel constructed vehicles is through a process called “electrodeposition,” which is completed after the vehicle’s metal parts are assembled and before the painting begins. As long as the metal is coated and the coatings are not breached, the steel will have a long resistance to corrosion. 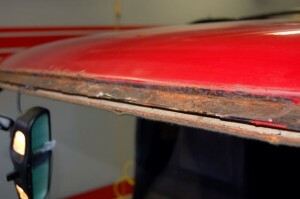 If there is rust on the pinchweld, the cause is only one of two options; it is caused by bad body work or caused by the breaching of the painted surface by an auto glass installer. 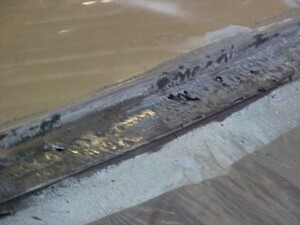 Rarely does corrosion happen by itself once the surface has been prepared and coated. With this in mind, we must acknowledge our culpability and develop our skills to avoid scratching the metal. Here are some issues that we must avoid doing and guard against. Use extreme caution when plunge-cutting. Plunge-cutting is inserting a utility knife blade perpendicular to the pinchweld to cut a moulding off or make the cut out procedure easier. It is sometimes necessary to cut off a moulding or encapsulation material to get to the glass edge and the best tool for that procedure is the utility knife. However, it should never be inserted to the point of scoring or scratching the metal surface below. If that blade scores the metal then the chance of successfully priming that scratch is very low. It would take tweezers and a considerable amount of time to properly prime the area. If you do not prime the area thoroughly, then corrosion will occur and undermine the entire bond. 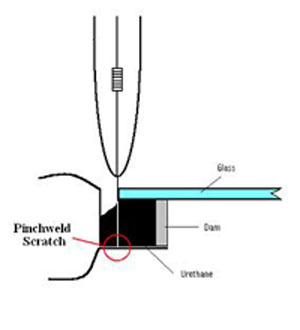 When cutting out the glass part with a cold knife and tapered blade, remember that the taper designed into the blade will cause the blade to naturally move outwardly towards the pinchweld wall possibly causing damage to the wall of the pinchweld. Make sure that you control your knife and blade so the vertical leg of the blade stays at the glass edge. It also may be good insurance to use padded/coated blades. In close tolerance glass mountings, a wire may have to be used to eliminate the chance of paint damage. If a cold knife is chosen, make sure before you pull the knife that the blade will clear the pinchweld wall. When stripping the existing urethane to the proper height, make sure that you use the “pull and cut” method of strip-out. If you pull the existing urethane while stripping it from the pinchweld it serves two purposes; it indicates if there is a bond weakness and it allows for a more controlled strip-out. It makes no difference whether you use a utility knife or a scraper the “pull and cut” method makes the strip-out easier and makes it less likely that damage to the pinchweld will occur. Using power tools from the outside of the vehicle allows for the technician to see where the blade exits the bead. This allows the technician to control the tool rather than work blind and cause damage to the lower pinchweld wall or firewall. I have watched installers use a reciprocal blade cutting tools on an “L” shaped pinchweld that badly damaged the pinchweld wall. I have even seen them puncture the metal. This should be the very last resort to glass removal. 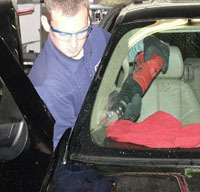 First, they are cutting it blind and the blade can easily damage the roof area of the vehicle. Second, I don’t care how good you are, the wall of the pinchweld will be damaged seriously and no amount of primer can completely stop the metal from corroding. Third, it just looks and sounds bad to the customer that is watching. Obviously, the best way to deal with corrosion is it to eliminate its cause and improve your skills. 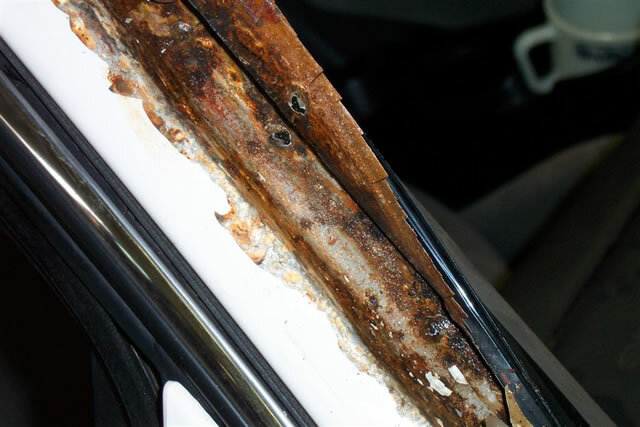 I know that corrosion will always be a problem but if all of us make strides in our ability to avoiding breaching the paint and coatings, we can eliminate a lot of it and get back to what we do best and that is putting in auto glass correctly and safely. Those of you that have attended one of my seminars or training programs know that I push the first step of my seven steps more than any others—pre-inspection. Why do I think pre-inspection is important? If you do not look the vehicle over before beginning the work, you’ll wish you did, especially when it comes to the existence of corrosion. If corrosion is found after the glass is out, you have two options—fix the problem or forget it is there. Well, that may not be fair. Actually, we should define the levels of corrosion and then weigh the possible options. Light Appears like a brown discoloration with some beginnings of metal pitting. Treatable. Moderate Has significant metal pitting but can be removed with no weakening of the frame. Treatable. Severe Very deep metal pitting with no appearance of metal weakening but removal may compromise the frame. Possibly treatable. Perforation Metal is flaking and expanding or metal is missing and displays holes in the metal. Body work is required. Now that we have defined corrosion let’s talk about finding it before we take the vehicle apart. During the pre-inspection step it is very important to look for indicators that will give you a warning that corrosion is present. Once you find it you can determine the severity and decide the course of action. Check the glass “bug.” If it has been replaced before there is a good chance that the prior installer did not prime the scratches good enough or missed some scratches. This could indicate a presence of corrosion. Is there some corrosion showing itself from under the reveal moulding? If there is corrosion present, you can bet that it is worse underneath. Plus, you cannot treat the corrosion present because it is on the visible painted surface. If you do not get rid of all of the corrosion it will spread and become worse. Look at the dashboard area. 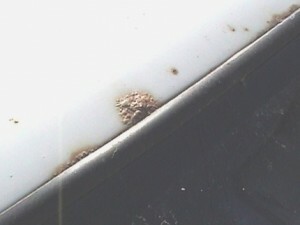 Corrosion near the dashboard indicates that the lower pinchweld is corroded and will need treatment. Now get inside and look behind the headliner and behind the “A” pillar garnish moulding. 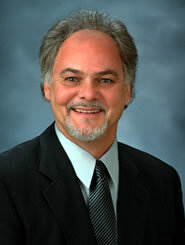 If there is corrosion, determine the severity and include the customer in deciding what to do next. In my last article I said that once corrosion is present it must be dealt with. The best way to deal with it is to treat it and get paid to do it. Easier said than done, right? Well, again, the facts are the facts. Corrosion will not allow bonding to occur and without bonding, safety is compromised and leaks are certain. Why would anyone want to put themselves into that scenario? It is a lose/lose situation where nobody is a winner. Yes, someone will do it down the street but I would suggest that it not be you. Convince the customer that you will not compromise their safety for any price. Convince them that no adhesives stick to corrosion. Nobody has magic glue that sticks to corrosion—nobody. Convince them that they chose you to do their work because they wanted the best installation for the best possible price and you will not betray their confidence in you. If you compromise your business reputation, your business will now be headed for failure. How do I get paid for corrosion treatment? You sell it like you sold your glass service. Quality costs money and you’re a quality company. If they take it to a body shop they will pay much more in money and inconvenience than allowing you to do it now. Give them an estimate and a warrantee that proves your professionalism. Give them the choices and close the sale. What if the customer says no? Offer to split the cost with them or give it away if you think that the free extra time is worth the installation profit. I live in beautiful southern Wisconsin which blesses us with four seasons that each and every one of us looks forward to year after year. Spring offers new life with budding flowers and new growth. Summer has warm temperatures and outdoor activities, while fall has beautiful colors and crisp air to fill the lungs. Winter is filled with holiday anticipation and fun in the snow. The beginning of each season is anxiously anticipated because we become bored with the previous one. We like the new season but always look forward to the next one, even winter. 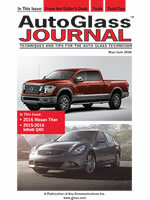 Changing seasons are desirable for many reason,s but they are also a challenge for the auto glass professional. Not only do we need to pay attention to the procedures we practice but also we must keep an eye on temperature, humidity and the occurrence of corroded metal. 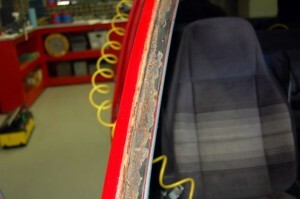 Corrosion is a bad thing when it comes to auto glass installation. It is a condition that must be dealt with, whether we like it or not. Adhesives do not adhere to rust. Corrosion will always get worse unless it is slowed down. Corrosion is caused by exposure to oxygen. If the “E” coat is breached, the metal will corrode. Typical pinchweld primers are not rust-inhibitive. Corrosion must be dealt with or the installation is unsafe. I know, more than most, that corrosion is a pain to deal with because up in Wisconsin we use road salt to clean our roads of snow and ice. Salt accelerates the oxidation of metal if the metal is unprotected. So, if a previous installer did not protect the exposed metal on a pinchweld by applying a coating of primer, then the vehicle will be corroded. I deal with this on a weekly and sometimes daily basis. What do we do? The next series of articles will be dealing with the observation, cause, prevention and treatment of corrosion, as well as how to deal with the customer when corrosion is found and how to get paid for the service you render.